We all know that a great deal can be accomplished by simply taking things one step at a time but it’s easy to forget. Yesterday it felt like my mystery socks would take forever to complete but lo and behold, by the end of the evening they were done. There are some elements of these socks I'm not crazy about, like the Dutch heel and the new-to-me toe (in which the stitches are divided into thirds and decreased along those lines), but I feel honored that Nancy Bush took the time to design a sock just for SKA and I enjoyed knitting it along with everyone else. I really liked doing the vickel braid and look forward to including it on a future project. 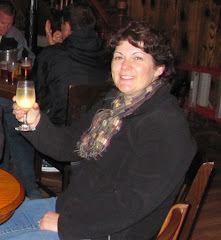 So, with that out of the way my thoughts turned towards October’s challenge. 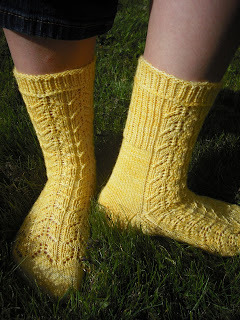 I only intend to make one pair this month and couldn’t decide between a man’s sock or a Jeannie Cartmel design. However, I soon realized that the idea of knitting for a size 10 foot right now didn’t really appeal to me so in the end the choice was easy. But which one? Jeannie has some really fabulous, intricate patterns that I’ve been eyeing for a long time. The one in her ravatar, “Summer Sliding”, is particularly stunning. Maybe it was the late hour or maybe it was the sense that I’ve already fallen behind but I just couldn’t face the idea of twisted stitches and detailed charts so I settled for something simpler, “Woodelves”. 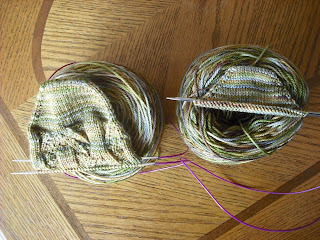 I quickly found just the right yarn in my stash, some Fleece Artist Trail Socks in appropriate shades of green, brown, grey, and tan. What could be more perfect for woodelves? Just to challenge myself I tried the Turkish cast on for the first time. Monday morning’s mail brought the latest installment in the Embrace the Lace club. 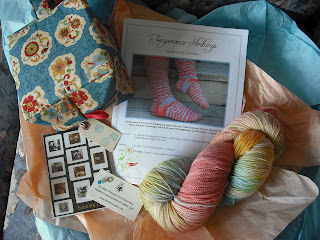 This kit’s theme is “Temperance” and the yarn and pattern are the work of my good friend, Lori Law, of Oceanwind Knits. 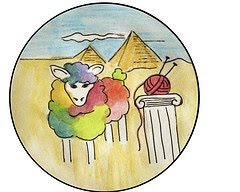 The yarn is dyed in soft shades of blue, green, yellow, and pink and is to be knit into a pair of knee-high stockings. At first I dismissed the idea of making these for myself because I don’t wear knee socks but I really liked the yarn and was reluctant to give it to someone else. I considered keeping the yarn and making something else out of it but in my opinion that goes against the spirit of the club. To me, the whole point of joining a club like this is to go out of your comfort zone and be open to yarns, colours, and designs you might not have chosen for yourself. So, with this in mind, I’ve decided to keep the yarn and knit the pattern for myself after all—I think they’ll make very cozy house socks now that the weather is turning cooler.